Garages are not the fanciest rooms in the house but it is the most useful. Traditionally, it is meant for a care but it has become such a versatile space that it can be used as a workshop, storage unit, and even a recreational space. To be able to use the garage for many other things, it needs to be tough and durable enough to accommodate any other purpose. That is what decorative garage floor coatings are for. Without replacing the current concrete slab that you have now, the floor can be made stronger and more resistant to damage than it has ever been. Plus, it makes it look really good, too. Epoxy Flooring – An epoxy coating is made up of equal parts of a resin and hardener. It cures to a seamless and tough surface that is resistant to impact, abrasion, chemical spills, and more. Epoxy flooring garage comes in a wide range of colors, like pastel, earth tones, and metallics, too. 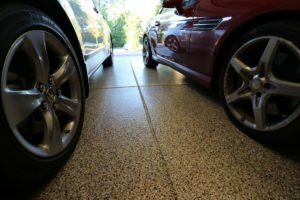 Polyurea Polyaspartic Coating – Although developed originally for industrial floors, polyaspartic is now recommended for garage floors. It is such a tough coating that it is able to resist any type of damage. One reason why home and business owners prefer this epoxy alternative is that it is fast-drying. Epoxy and polyurea polyaspartic coatings dry to seamless surfaces. This means there are no grooves, holes, or gaps where dirt can settle in. It is also non-porous so dirt and liquids stay on the surface. Regular sweeping and mopping are enough to keep the garage floor clean. A pressure wash can be done for built-up and stubborn dirt. This type of coating does not require any special cleaning products but if you do find it necessary, consult the installer to know if it is safe to use on epoxy or polyaspartic. We are Here to Help You Enhance Your Garage Floor. Call (720) 545-1766 for a Free Consultation. No one else does it with utmost craftsmanship and attention to detail than Denver Concrete Artisans. Think of us as your partner in optimizing your garage floors without having to invest a ridiculously high amount of money. Our team of professionals is highly trained in all aspects of resurfacing, refinishing, and repairing concrete. Call us for a free discussion on what your garage floor options are. We’ll give you a free quote, too!